Northstowe is a new town in Cambridgeshire, promoted by Gallagher and Homes and Communities Agency (HCA). It will be the home of around 25,000 people and is one of the NHS’s Healthy New Towns (HNT). Tibbalds was appointed by the Homes and Communities Agency to prepare a Design Code for the first two Phases of the development. 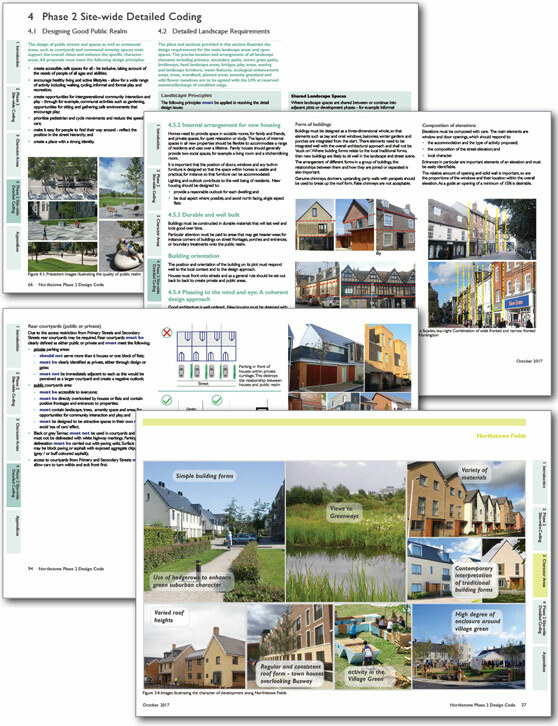 The design code has been developed in collaboration with District and County Council’s and includes site specific requirements as well as over arching guidance on how to create design quality. The HCA has very high aspiration in terms of creating a contemporary new town of the highest development quality. The Design Code is a comprehensive guide that will determine the aesthetic of the second phase of development, including street types, public realm and typologies, and approaches to mixed use town centre development. A choice of attractive routes, higher densities and variation in character help to deliver streets and spaces that are safe and interesting to walk along. The routes through attractive landscaped areas will be lined with regular seating opportunities to allow resting points for the elderly and those with disabilities. Public toilets and drinking fountains help people with a range of health conditions, including obesity and diabetes. In order to maintain healthy hydration the Design Code requires drinking fountains to be located adjacent to play areas and alongside key walking routes, the sports hub and within the town centre. The code sets out requirements on how to integrate these often forgotten issues. For example, cycle parking requirements address the need for non-standard bikes, such as dutch style loading bikes and child carriers. Apart from cycle storage within individual houses, the code promotes communal bike stores with bike repair stations to encourage community interaction. For the less able and elderly, every house or block of flat will have a charging point for electric bikes and mobility scooters. Waste collection is also partly within communal storage in order to free the frontages of homes and avoid unattractive rear passage ways. The Design Code identifies the requirement for allotments and promotes edible landscapes, each of which is easily accessible by bike. The Design Code was approved October 2017.